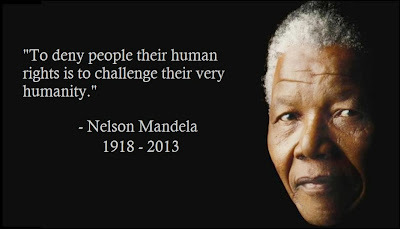 As countless obituaries, eulogies, elegies, panegyrics, and encomia pour in following the death of Nelson Mandela, who died Thursday December 5, 2013 at the age of 95, the sanitization and mythologizing of his principles and legacy is already in full swing across the political spectrum. We will hear little of the fact that in his courageous and unfaltering stand for freedom and justice, he routinely refused to rhetorically renounce armed resistance to vicious, racist and violent oppression. We will read even less about his outspoken condemnation of the “injustice and gross human rights violations…being perpetrated in Palestine” and how he declared that, even with the fall of Apartheid in South Africa, "we know too well that our freedom is incomplete without the freedom of the Palestinians...Yes, all of us need to do more in supporting the struggle of the people of Palestine for self-determination." In a 1999 visit to the Shati Refugee Camp in northern Gaza, Mandela said, "The histories of our two peoples, Palestinian and South African, correspond in such painful and poignant ways, that I intensely feel myself being at home amongst compatriots." He added, "The long-standing fraternal bonds between our two liberation movements are now translating into the relations between two governments." Endless comparisons between Mandela and Martin Luther King, Jr. will be made in the mainstream; yet few will note that both men were tireless critics and opponents of American aggression and imperialism and reviled by many in the U.S. establishment as threats to the existing power structure. Both consistently linked their own struggles for freedom and equality with global movements for social change, for human rights, for universal dignity. As a result, King was relentlessly spied on by the FBI. Mandela was arrested by the Apartheid government in 1962 with the help of the CIA, spent nearly three decades in prison and then languished on the U.S. State Department's terrorist watch list until 2008. He was almost 90 years old. While in 1967 King named the United States as “the greatest purveyor of violence in the world today” and spoke out on behalf of the “hundreds of thousands trembling under our violence,” Mandela too castigated the American policies as often dangerous and destructive. The United States has made serious mistakes in the conduct of its foreign affairs, which have had unfortunate repercussions long after the decisions were taken. Unqualified support of the Shah of Iran led directly to the Islamic revolution of 1979. Then the United States chose to arm and finance the [Islamic] mujahedin in Afghanistan instead of supporting and encouraging the moderate wing of the government of Afghanistan. That is what led to the Taliban in Afghanistan. Months later, in early 2003, Mandela told the International Women's Forum, "It's a tragedy what's happening, what Bush is doing. All Bush wants is Iraqi oil. There is no doubt that the US is behaving badly. Why are they not seeking to confiscate weapons of mass destruction from their ally Israel? This is just an excuse to get Iraq's oil." "If there is a country that has committed unspeakable atrocities in the world, it is the United States of America," he added. The following year, during a visit to Havana, Mandela hailed the Cuban revolution as "a source of inspiration to all freedom-loving people." He added, "We admire the sacrifices of the Cuban people in maintaining their independence and sovereignty in the face of a vicious, imperialist-orchestrated campaign. We, too, want to control our own destiny." "No matter what the odds, no matter what difficulties you have had to struggle under, there can be no surrender," he said. "It is a case of freedom or death." Reacting to criticism voiced by Western governments about the ANC's relationship with Castro, Arafat, and others, Mandela firmly declared, "We are now being advised about Cuba by people who have supported the apartheid regime these last 40 years. No honorable man or woman could ever accept advice from people who never cared for us at the most difficult times." Of all the pieces written about Mandela today and in the future, one must wonder how often we will read these words. how refreshing to read this. not just illuminating but also a true depiction of mandela's character. thanks for posting it nima.